Trees are like children: you get out of them what you put into them. The more you can help with water, fertilizer and good conditions, the faster they will grow and the sooner they will come into production. New plants haven't developed enough feeder roots or storage roots to find and store the water they need to survive, so you must water new plants. Water with intelligence, not just on a rigid schedule. Place your finger in the soil above the plant's roots each day. If the soils is dry, water. It the soil is not dry then do not. The roots of a tree need oxygen, and too much water deprives them of that. Harming a plant's roots when it is young can negatively affect the plant for the rest of its life. Your planting site selection should be well-drained (better than apple trees require), non-low lying area, sandy loam soils with a pH between 5-6.5. The best location is a south slope, with good air and water drainage - avoid frost pockets. A sheltered north-facing slope protected from drying winds and low sun of winter may be better for cold windy sites. The most common mistake in chestnut cultivation is to plant them on sites that are too wet or too "heavy" (too much clay). Dense clay soils stunt root growth and hold on to too much water, leading to weak, slow-growing trees. Clay soils can be tolerated if there is good surface drainage (slope), but chestnuts do best on deep, sandy loams. . Full sun 8 hours is required for nut production minimum of 6 hours of full sun. Non-filtered sun. Prepare the area by removing any weeds prior to planting. This step is often overlooked but is absolutely critical to any successful planting. Weeds and grass steal light, water and nutrients from your trees. We recommend weed mats. Carefully remove the tree from the pot keeping the soil around the roots intact. It helps to tap the outside of the container to loosen the edge. Do not yank the tree out of the container as this can separate the roots from the tree. If the roots are curled or wrapped up inside the pot, spread them out or cut off severely curled roots. This will promote new root growth. Partially fill in the planting hole with the native soil. Set the tree in the middle of the hole. Avoid planting the tree too deep. Using some soil, secure the tree in a straight position,then fill the native soil and firming the soil around the lower roots making sure there are no air pockets. Keep back-filling until the soil is level with the root collar. Water is the single most important factor for tree survival. If the year you plant is like the severe drought experienced by the Midwest several summers ago, if you do not water your trees they will die. The truth is that many trees die from too little or too much water during the first few months after planting. Trees are likely to get too little water in well-drained soil and too much in soil that is poorly drained. We recommend for best success to supplemental water your newly planted trees for the first two years. Newly planted trees planted in the spring should be watered regularly (2-4x/week) for the first year especially if rains are infrequent. Water thoroughly but do not over-water; the soil should dry down slightly between watering. Irrigation from lawn sprinklers is generally not sufficient until the plants are well established. 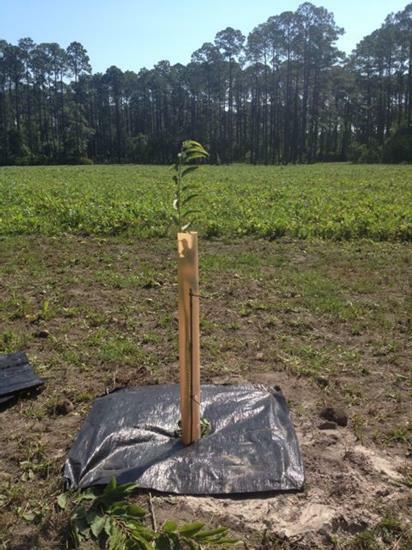 This is the most critical step in the establishment of your new trees! Fertilizers can burn the tender roots of young trees before they become established. When planting bareroot trees or 1 yr old potted trees we recommend waiting to fertilize them after one year of being planted. For two year old or older trees we recommend waiting at least two months after planting then fertilize with a time-released fertilizer such as Scotts Osmocote Plus Outdoor & indoor (15-9-12), Espoma Holly Tone or Tree Tone Organic Fertilizer. After applying the fertilizer make sure you water your trees for absorption. For mature trees 10 yrs and older we recommend using Scotts Osmocote Vegetable/Flower (14-14-14), Espoma Holly tone or Tree Tone Organic Fertilizer recommended amount per directions. Fertilizing too late in the season can cause trees to grow when they should be shutting down for the winter. This tender new growth, when pushed too late in the season is also more susceptible to winter injury. Soil's acidity or alkalinity is determined by pH. The best range for growing most fruit and flowering trees is between 5 and 6.5. Soils in much of the South fall within this range. Soils in pine woods are often lower (4.0-5.0) , and need to be raised by the application of lime or dolomite (see your County Agent for a soil test and recommended rates). Other areas (such as Texas) have soils with pH>7, which will need to be acidified or lowered by the application of nitrogen sulfate or other sulfur-based fertilizers. It is important to keep grass and weeds from competing with young trees - they are the biggest competitor for young trees and steal water and fertilizer from the new plantings. Try to keep a 2-3' circle clear of weeds from the base of the trunk. Mulch moderates soil temperature extremes and helps moisture retention as well as keeps weed growth down. 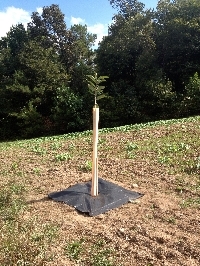 We recommend Grow Tubes, because you can spray Roundup or other herbicides close to the tree without hitting the stem. If you do not use Grow Tubes, be very careful with herbicide, especially on young trees, because they can absorb it directly through the bark. It only takes a few drops to kill the tree; so apply only when there is no wind, use a colored dye mixed in the herbicide so you can see it being applied and protect the trunk with a shield or hood on the fertilizer wand. Most plants including chestnuts, apples, pears, oaks, blueberries and some grapes need more than one variety to cross-pollinate and bear fruit. We will make sure that you receive more than one variety when you order 2 or more of these types of trees.Plant no farther than 50’ apart for best pollination. Pruning is usually necessary only in the first several years to shape the tree to its appropriate form – central leader, modified leader or open-vase (see pictures). Most nut trees grow naturally with a straight trunk (central leader) with only a little pruning required. Occasional pruning is necessary to open the center of the tree for greater light and air penetration. Light annual pruning of dead wood or an out-of-place branch helps older trees by rejuvenating growth and promoting better fruit production. Grow tubes help with weed control (by protecting the tree from spray and drift from herbicide) and offer cold protection in late season frosts. 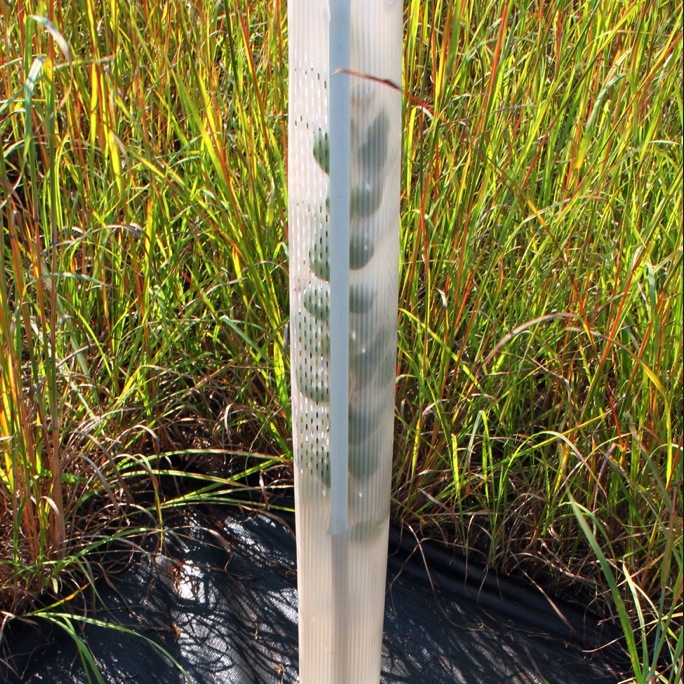 They can dramatically increase growth rates, and one-year seedling often grow out of the top of a 4’ tube in 1 season! The Grow tube stays on until the tree outgrows the tube, usually after 4-5 years. 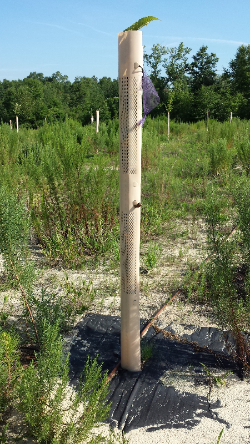 We recommend Grow Tubes in all wildlife plantings. If you are planting an orchard or a large food plot, it will be much less expensive to use a 3-wire Electric Fence to keep deer out of your planting. Dr. James Kroll has determined the best system that provides 99% exclusion. This is much cheaper and easier to install than building dozens or hundreds of cages, and much less expensive than 8’ metal fencing. You should still use Grow Tubes for the trees. For more information on the best system to keep deer out of a large planting.